Who says vegans can't eat rich, decadent, unhealthy foods?! While I'm certainly not advocating a fatty diet, we can all indulge in moderation, right? 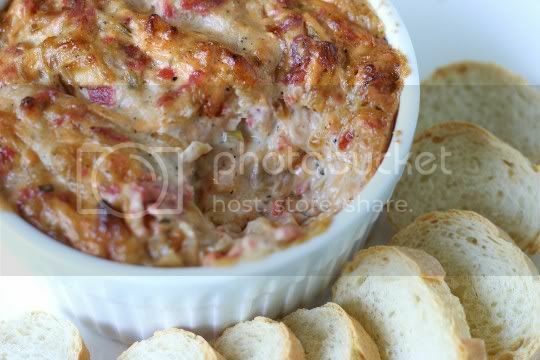 If you're in the mood for some true comfort food by way of a super easy-to-make appetizer, you must make this immediately! Seriously, this stuff is amazing! With my first bite, I almost couldn't believe it was vegan. This would be a perfect dish to bring around a bunch of meat-eaters (watch as eyes widen with their first tastes). It's certainly got all the nontraditional vegan flavors and textures: meaty, cheesy, ooey-gooey, sticky, thick, and extremely rich. 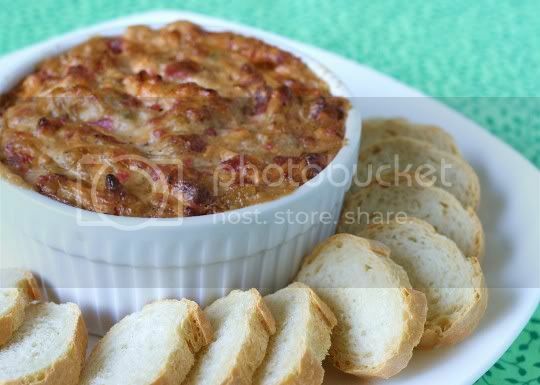 The onions, which are nicely caramelized before adding them to the dip, provide a lot of sweetness, which is contrasted prefectly with the saltiness from the Daiya and tanginess from the Tofutti. I used 1/3 cup of Bacos (yes, they're vegan) in the recipe, but I realized the faux bacon flavor might be a bit overwhelming for some. So cut it down to 1/4 cup or even just a few tablespoons if you want the sweet oniony flavor more pronounced. This is best served fresh and hot from the oven, although leftovers keep and heat surprisingly well. 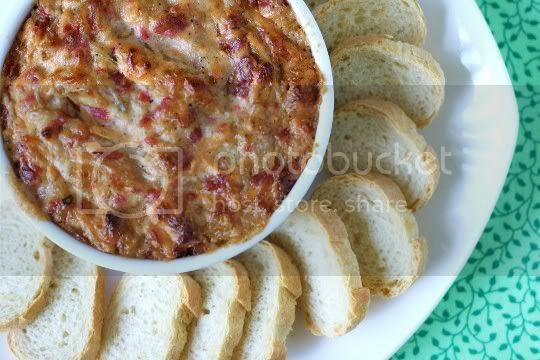 Sliced sourdough baguettes are a must with this dip, but any kind of sturdy cracker or chip works too. And although you'll be on the path to diet destruction eating this, feel free to throw some veggies in too: carrot sticks, celery, endive, and anything else dippable. But what goes even better with a combination of onions, cheese, and bacon...? Are you thinking what I'm thinking...? Yes, BEER!!! A medium-bodied ale or crisp pilsner is an amazing complement to the strong, meaty flavors of this dish. In fact, bring this to your next game day and watch it get devoured before the second quarter! Preheat oven to 400. Melt butter and oil in a large skillet over medium-high heat. Add onions, sugar, and salt. Cover and cook, stirring occasionally, 30 minutes or until onions turn deep golden brown. Remove from heat. Stir in vinegar and thyme, and set aside. 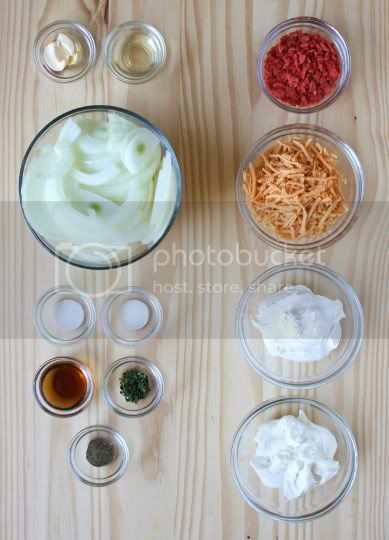 In a large bowl, combine sour cream, mayonnaise, cheese, Bacos, and pepper. Stir in onions. Transfer to a 2-cup baking dish. Bake 20 minutes or until mixture bubbles and top is browned. Nutritional data (per 1/4-cup serving): Calories 226, Fat 18g (Saturated 4g), Sodium 409mg, Carbs 12g, Fiber 1g, Protein 3g. I can't wait to try this!! Looks so YUMMY! Holy smoky bacon! This is genius. I love veganizing things to trick meat eaters too! I just made a vegan spinach artichoke dip that was pretty delish. Thanks for the recipe! Okay, REALLY????! You have just given me butterflies in my stomach over food. I cannot wait to make this! I seriously bookmarked this and it is on my to-make list :) THANK YOU! oh my STARS I cannot wait to make this. I can almost taste it now, and I know it will be a hit with anyone. thank you for sharing - good to find you too, you have just been added to my reader. hi again - I am getting ready to make this - I'm assuming the baking temp at the end is around 350, is that right? Hi Kris, I kept the temp at 400. I absolutely cannot wait to make this! My husband is gonna freak out! Found your blog through Finding Vegan (appropriately enough), and just had to say that this dip looks incredible! Hmmm. Even though this sounds good - I hate to think about all the artificial ingredients and preservatives in the bacos and probably in the other "fake" stuff. Why not make some vegan dishes that are good in their own right instead of remaking dishes that are originally made with REAL ingredients containing animal products? Let's see a dip that uses REAL stuff and not a bunch of fake stuff. Vegan or no vegan, let's eat REAL and skip the high sodium, loaded with preservatives ingredients. Why do you care what other people eat? because it's fun to every once in awhile make something we probably shouldn't eat more than once a year. and of course getting omnivores to eat something vegan, healthy or not, is always amusing. This looks so so so delicious. I can NOT wait to try this! This was served at a friend's party last night. It's incredible. I'm not vegan (not even vegetarian) and I was floored by this dip. A much healthier alternative than using real bacon and cheddar, and every bit as good. I can't wait to make it myself. I made this yesterday but I used it as the stuffing for my stuffed mushrooms! It was killer! Thanks for the awesome recipe! I made this today and WOW - so good! I can't wait to share this with friends and family! How many people does this dip feed as an appetizer? It looks amazing! Hmmm good question. I'd say maybe 10-12? Perfect thanksgiving app! Looks awesome. Happy VegNews sent me thisaway! Holy drool. This looks incredible and perfect for Thanksgiving. I also came from VegNews. One question though - I'm surprised the recipe calls for a sweet onion. America's Test Kitchen/Cooks Illustrated did a test that found, surprisingly, that yellow onions actually contain more sugars than sweet onions; sweet onions simply have less sulferic compounds than their yellow counterparts so they taste sweeter raw. Given this - is there another reason to use sweet onions in a caramelized onion dish? I used sweet onions in the recipe, and the onions were definitely sweet and added sweetness to the finished product. I'm sure you'd be fine with whatever onions you decide to use! This looks delicious. Is there a basic ingredient that can replace the sherry vinegar? I'm hesitant to buy this just for 1 Tbsp since I never use it. I'm wondering if a mix of regular vineger and wine (or other alcohol) will work. I'm sure that would work. Or you could just go with straight alcohol :) If you have white or red wine vinegar, that would probably work too. I used the red wine vinegar, and it turned out WONDERFUL! So rich and creamy...hard to believe it's vegan! Thank you for sharing! I made this three times for the Thanksgiving holiday weekend: office party, vegan party and traditional Thanksgiving with family. THEY ATE IT ALL! and LOVED it! Yes, it isn't the healthiest, but it is easy to make and such a treat! My friends ate it on mashed potatoes because they ran out of chips and LOVED it. Said it tasted like loaded potato skins. Plus, with one tub of Tofutti sour cream and a jar of Vegenaise, you can make this recipe about three times! Perfect! Also, I subbed the sherry vinegar for red wine vinegar and it is still great. Everyone is begging for more and wants your link. THANK YOU FOR THIS IDEA! Yum! Woo hoo! Glad to hear about the rave reviews! This recipe is fabulous!!!!! I've made it multiple times and everyone, meat eaters included loved it! I hate to be a nitpicker, but I just have to say it...all mayo is non-dairy. Eggs are an animal product, but not a dairy product. I think what you really mean is "vegan mayo", not "non-dairy mayo." However, this does look absolutely delicious and I can't wait to try it! this is great! its been a hit every time i've made it! Finally made this and I'm in love. 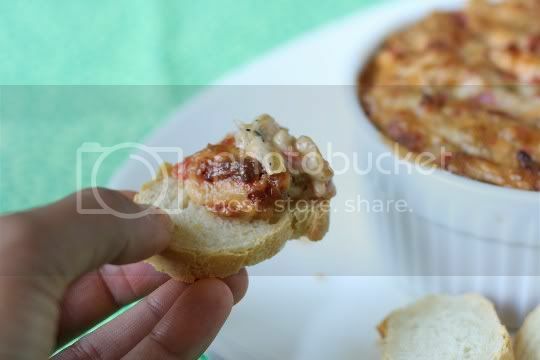 I think the base mixture could be used for spinach artichoke dip or other variations really easily, because the recipe took to my on-hand substitutions quite nicely! I want to make this for an afternoon office party and I'll need to bring it from home. Can I make it in a crock pot? Does it need to be kept warm?